It was actually the unluckiest day for the main character. This writer created a very witty title for the story. It seemed to be a lucky day, but turned out to be the most unfortunate day, but still he gave it the title “A Lucky Day.” That title engaged readers so much that they had to keep reading to see how that lucky day would progress. The story is about a day in the life of a rickshaw puller, Kim Cheom-ji, in Seoul in the 1920s, during the Japanese occupation. Just like the title indicates, it was a very special day for Kim Cheom-ji. It was a rainy day, with the half-frozen rainwater, not snow, falling from the prudish, cloudy sky. 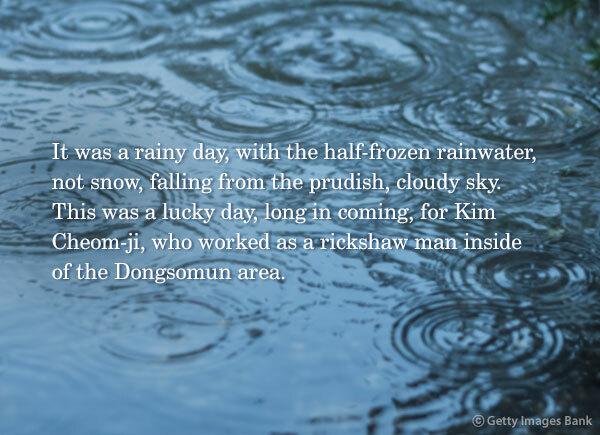 This was a lucky day, long in coming, for Kim Cheom-ji, who worked as a rickshaw man inside of the Dongsomun area. Having been awfully unlucky, Kim Cheom-ji hadn’t seen any money for nearly ten days, so he was delighted to the point of nearly crying when three and five 10-cent coins dropped onto his palm. 눈은 아니 오고 얼다가 만 비가 추적추적 내리는 날이었다. 오래간만에도 닥친 운수 좋은 날이었다. 거의 눈물을 흘릴 만큼 기뻤었다. The real face of the anxiety that has pressured Kim Cheom-ji since morning is at last revealed. It’s the conclusion that everyone, including the readers, has feared. Fat drops of tears falling down from the eyes of a living person dampens the dead person’s stiff face. Suddenly, Kim Cheom-ji muttered while wildly rubbing his face against the dead wife’s face. 죽은 이의 뻣뻣한 얼굴에 어룽어룽 적신다. 문득 김첨지는 미친 듯이 제 얼굴을 죽은 이의 얼굴에 한데 비비대며 중얼거렸다. The day that Kim Cheom-ji thought was unusually lucky was the day he wandered around the city, unaware that his wife was dead. It was the unluckiest day in his life. Hyun Jin-geon: Born in Daegu, Gyeongsangbuk-do Province in 1900. Arrested by the Japanese and imprisoned for a year in 397 when working as a newspaper reporter for erasing the Japanese flag from the uniform of Korean marathoner Sohn Kee-chung, who won gold medal at the 1936 Berlin Summer Olympic Games. “A Lucky Day” was published in Volume 48 of literary magazine “Gaebyeok” in June 1924. It is touted as a landmark piece in Hyun’s career as well as in Korean literary history.